Moose are best known for their antlers. Male moose have antlers from early spring to late autumn. Antlers will drop off before winter, but next year male moose will develop even bigger antlers. They are the fastest growing organ in moose. Antlers are heavy and large. They weigh 50-60 pound and grow up to 6 feet in the width. Largest measured pair of antlers had 7 feet in width. Main purpose of antlers is to attract females and to defeat other males during fight for their affection. Males are solitary animals and they gather only during mating season. Pregnancy in females lasts 8 months and it ends with one or two calves. They stay with their mother until next year, when new calves will be born. Mothers are very protective and they use their large hooves to generate powerful kick which can defeat predators. They are also fast runners; moose can run 35 miles per hour. Their main predators are wolves, grizzly and black bears. They will attack young moose whenever they can. Moose live 15-25 years in the wild and 20-25 years in captivity. Moose are excellent swimmers. They can swim 6 miles per hour without a break for 2 hours. 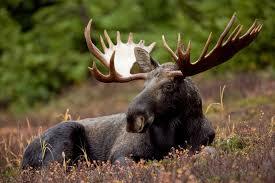 Moose have poor eyesight, but they have excellent sense of smell and hearing. They have 32 teeth in total. Their front teeth are missing. Due to their large size, they need to eat a lot of food. Their stomachs may hold up to 112 pounds of food at one time. Moose are herbivores (plant-eaters) and they like to eat flowering plants, shrubs, leaves and small branches of the trees. During the summer, they eat plants from the river, like pondweed and pond lilies. Males and females have the same height (around 4-6 feet at shoulders), but different weight. Males are heavier and they can reach 950 pounds, while females weigh up to 750 pounds.